As fighting rages in Mosul, Iraq, civilians in the city are caught in the crossfire with limited access to lifesaving medical care. Risking their lives, tens of thousands have fled since the offensive on the western part of the city started on 19 February. Thousands of wounded have been rushed from the conflict area by ambulance. In and around Mosul there is a lack of medical resources to treat the high number of patients and the ambulances referring medical emergencies to hospitals outside the city are simply unable to cope with the numbers of trauma victims and to travel long distances to transfer patients in need of further treatment. “The need for emergency medical care has risen drastically”, said Dr Isabelle Defourny, Médecins Sans Frontières/Doctors Without Borders (MSF) director of operations. “We have teams working around the clock treating men, women and children injured by bullets, blasts and shells. "Other life threatening emergencies also need a rapid medical response, such as for pregnant women in need of a C-section." “We have teams working around the clock treating men, women and children injured by bullets, blasts and shells." MSF teams in and around Mosul have received more than 1,800 patients in need of urgent or lifesaving care in the last two months. 1,500 of them needed treatment for conflict-related trauma. As the scale of the non-trauma needs also became apparent, we opened maternity services in eastern Mosul at the beginning of February, and since then the teams have assisted 100 births and performed 80 C-sections. Early March, we started to see children from western Mosul with severe malnutrition. Rapid malnutrition assessments were conducted in two camps for people most recently displaced. In March, MSF conducted a rapid screening for malnutrition. According to the people MSF met who are fleeing western Mosul, there is no infant formula milk left, there is a lack of food and clean water and conditions are expected to worsen now that supply routes have been cut off. This has led us to set up a therapeutic feeding centre in our hospital in Qayyarah. “It is urgent that malnutrition treatment be provided to meet the needs, and that those displaced from west Mosul receive adequate food aid when they arrive,” Dr Defourny emphasised. "Every case we receive is severe"
While our teams are providing health care in displaced persons camps, lifesaving emergency care has been the main MSF activity so far. 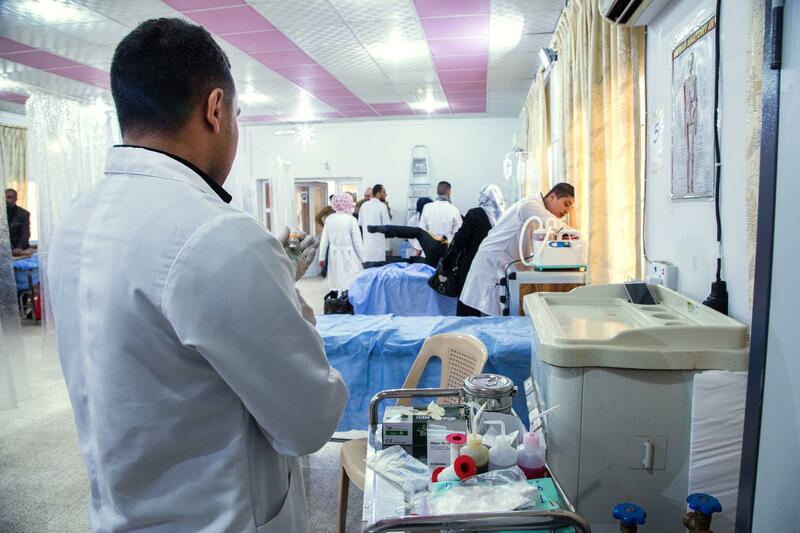 A surgeon in our field trauma hospital south of Mosul city described it as one of the toughest experiences in his long MSF career. “The situation here is really intense," he says. "Every case we receive in the operating theatre is severe and almost every day we have to deal with mass casualties." Since the start of the military offensive to recapture Iraq’s second-largest city in October 2016, MSF teams have been increasing medical and humanitarian assistance in Ninewa governorate working alongside Iraqi health staff to ensure the population has access to emergency medical care, including mother and child care. Our medical teams are working in eastern Mosul, in trauma centres and advanced medical posts around the city and providing healthcare services in newly setup camps for displaced people fleeing Mosul. In Iraq, we rely on more than 1,600 international and Iraqi staff for our medical and humanitarian work in 10 governorates. In order to ensure our independence, we do not accept funding from any government, religious committee or international agency for its programs in Iraq, relying solely on private donations from the general public around the world to carry out our work.